Bearish pennant pattern formation can be considered to confirm the trend continuation or trend reversal. When a bearish pennant pattern is to indicate trend continuation, it will have an inverse mast (long tail). Bearish pennant chart formation has one falling top containing resistance levels or lower lows, and one rising bottom containing support levels, higher highs. A bearish pennant pattern is similar to bearish flag pattern and symmetrical triangle pattern. Generally, at the beginning of pennant formation the volume tends to decrease,but increase also accepted.But along the pennant formation the volume is expected to decrease. At the break out point of pennant pattern the volume is expected to spike to ensure the reliability of the pennant break out. 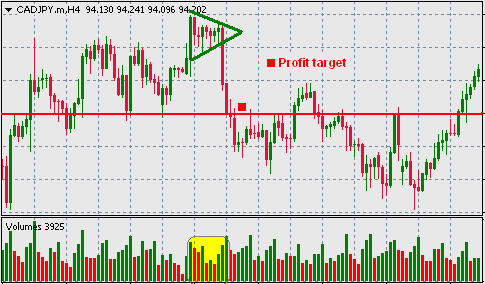 The profit target of an order with pennant formation should be the length of the mast. Both trend continuation and trend reversal is indicated by pennant pattern break out. When a bearish pennant break out indicates trend continuation the mast represents a strong previous bearish trend, in other way when a bearish pennant break out indicates trend reversal the mast represents a strong previous bullish trend.